The Ultimate Weapon, Alpha. Mobile Legends gives very good heroes, now we have a Alpha. 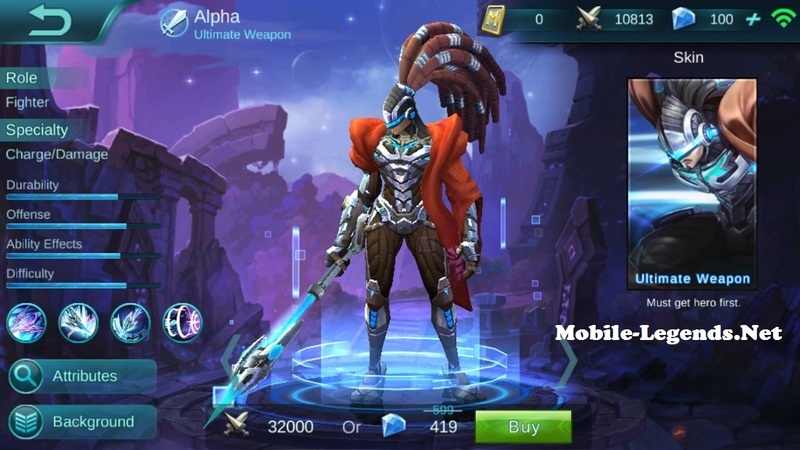 Alpha good fighter and he has true damage him passive skill. We will learn about very detailed information as soon. 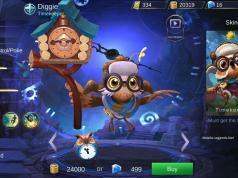 Now Alpha 32k BPs and 599 Diamonds. Passive: Go Beta!, Using skills will summon Beta to attack and mark the target. Beta will attack the target continuously after 2 mark(s), dealing 180 pts of true damage in total. Skill 1: Rotary Impact, Launches a slash forwards, dealing 235 pts of physical damage to the enemies a long the way and lower their movement speed 60%, lasting 2s. After the light wave launches, Beta will follow its trace to strafe, dealing 95 pts of physical damage. Skill 2: Force Swing, After powering up for a while the hero will strike forwards in a conical area and deal 245 pts of physical damage to enemies and slow them down. Every hit on an enemy will increase self’s attack speed by 5% and restore 85 pts of HP. While powering up, Beta will strafe at enemies along the edge of attack range, dealing 105 pts of physical damage. Ulti: Spear of Alpha, Wields the light spear powerfully, stunning the target when it hits. The hero will be pulled to the hit enemy, dealing 355 pts of physical damage to enemies along the way. When the light spear hits, it will guide to fight suit to strafe toward the target’s area, dealing 205 pts of physical damage. 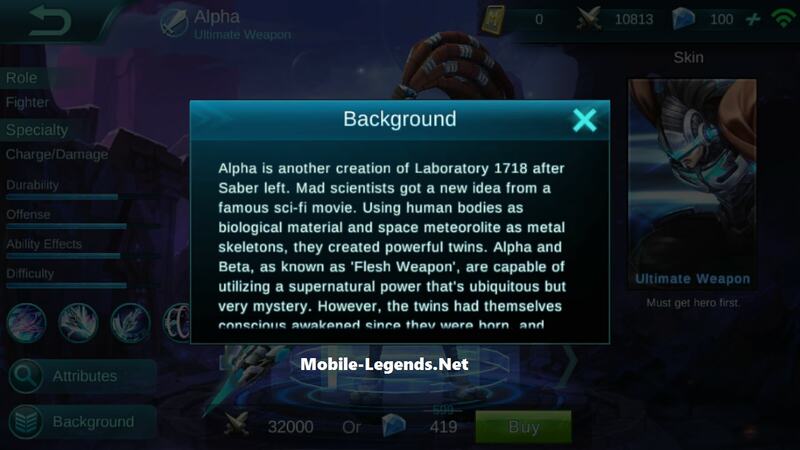 Alpha is another creation of Laboratory 1718 after Savber left. Mad scientists got a new idea from a famos sci-fi movie. Using human bodies as biological material and space meteorolite as metal skeletons, they created powerful twins. Alpha and Beta, as know as ‘Flesh Weapon’, are capable of utilizing a supernatural power that’s ubiquitous but very mystery. However, the twins had themselves conscious to become killing machines. Getting help from Saber, they escaped from the alt-wold. However, on their way to escape, the made man Beta’s core was destroyed. All that Alpha could bring out was Beta’s half metal arm. After coming to the Land of Down, with the help of master machinist Rooney, now Beta keeps company with Alpha as a from of an aircraft.